Every bodybuilder dreams of a massive inflated chest, and everyone will do everything to be so. But, because of busy gyms, not always possible to take place under the sun, but rather a place for bench press. What to do in this case? To go home is not an option. But to train chest by other sets of exercises, this is what you need. So today we’ll talk about a set of exercises for pectoral muscles. Let’s begin our workout with reps. The best way to gain weight, basic exercises, so choose exercises 3-4 and do them to the failure. Remember one thing, your body adapts very quickly to stress, so you need to change constantly the set of exercises. Warmed-up the muscles? Now, will start with pumping of the chest muscles. First Exercise. Layout on the vertical block. This exercise will help diversify your exercise program by pumping the chest muscles. What is the essence of this exercise? Layout on the vertical blockwill help to train the inside of the chest muscles where the muscle is attached to the sternum. – Leaning forward a little, start to pull the handle toward each other until your hands meet in front of in your thighs. – Having reached the end point, tighten the chest and slowly return to starting position. – Always follow the movements of your hands, remember, the palms should be turned to each other and elbows slightly bent. Second exercise. Layout of dumbbells lying. This exercise will help to train the chest in the stretched state, the maximal voltage you reach, spreading hands apart. As layout on the bench and layout with vertical block will quickly develop the pectoral muscles. 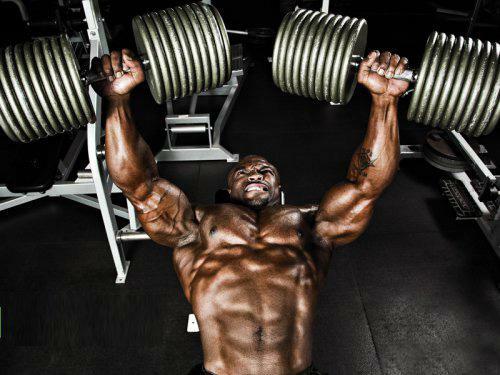 – In each hand, take a dumbbell with an average weight and lie back on the bench. Take-home position and straighten your arms over chest, palms turn inside. – Slowly spread your arms to the sides and lower the dumbbells. Bend your elbows slightly. You should lower up hands as long as you do not feel like your chest muscles are tightened. – Pay attention to technique. Do not lower the arm below a comfortable level. – After reaching the maximal point and stretching the pectoral muscles, slowly return the weight to starting position. Tighten the muscles at the top. Repeat this movement. Every bodybuilder prefers this exercise, after all, bench press is working through all the muscles of the chest. Bench press allows you to work with more weight, thereby stimulating the growth of muscle fibers. But there is a problem. Most bodybuilders do this exercise correctly, hurting the shoulder joints.To avoid this, spend some time on technique, and then take bigger weights. – Lie on the horizontal bench. Consistently put your feet on the floor, the body completely on the bench. Need to keep it this way during the whole exercise. -Hold the neck with grip wider than shoulder, lift the bar on the outstretched hands in front of chest. Deep breath! Slightly cave in the back and lower the bar down. – Lower the bar slowly until it touches the bottom of the chest. – Gently hold your weight down and hit the bar up to starting position. Exhale! – Stay at the top point, straining the pectoral muscles, repeat the motion. – Make the tension pectoral muscles during the entire exercise was constant.To do this, do not lower the bar on your chest completely at the bottom point and not output your elbows at the top. Related article: How To Get Rid Of Cellulite? Fourth exercise. Press on incline bench. This exercise is best done on the Smith machine, which allows you to use the weights without worrying about the fact that the bar will carry forward or backward. You are fully focusing on exercise. Properly performing bench in the slope, you gain weight on the upper chest without much effort. -Put an incline bench to 40 degrees and lie on her back. – Grasp the neck and with middle grip slowly lower the bar to the chest. – Try to maintain constant tension in the muscles, squeezing the barbell to the starting position. Fifth exercise. Dumbbell bench press on horizontal bench. The main difference between this bench press and barbell bench press, that you are using dumbbells, you have the opportunity to stretch your muscles stronger, developing in them a lot of stress. So the work of hands takes place independently of the body, you will need to balance and coordinate your movements. Experiment with different rotations of the hands, so you can vary the load of the muscles. -Lie on the horizontal bench, hold dumbbells near your shoulders. -Turn the palm inward and begin to squeeze the dumbbells up. During the movement keep your elbows at comfortable position. -Reaching the top, tense muscles, slowly lower the weight after a starting position. Working through the exercises – you`ll achieve desired results. Good luck in training!